I am incredibly proud of my long association with Intero Real Estate Services. Indeed I was the Inaugural Member of the Intero Hall of Fame, the company's highest honor for outstanding achievement (an award that's only been given to three Intero members since the company's inception). A few days ago I received an extremely significant communication from Intero President and CEO Tom Tognoli and I thought I would share it with you in this week's blog. 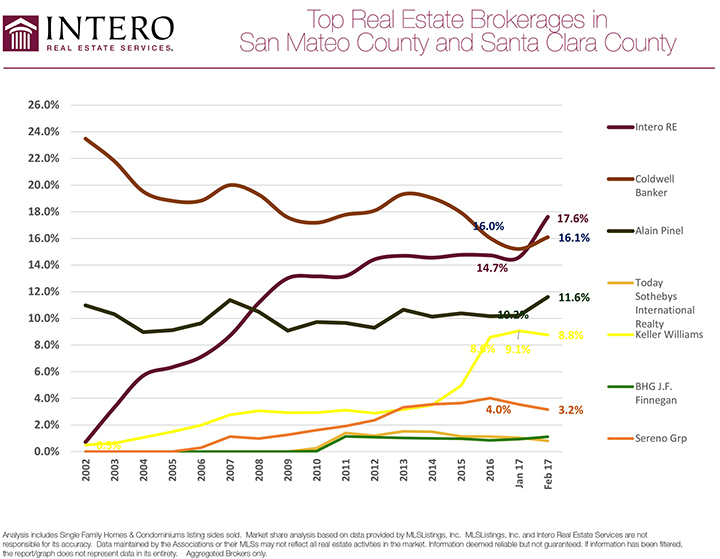 The graph at the bottom of this article demonstrates an amazing landmark achievement for Intero in both San Mateo County and Santa Clara County. In the past couple of months, Intero has become the leader in these markets, with the greatest market share of any real estate brokerage. It's the first time Intero has been in this position in its 15 year history. This is the culmination of many years of hard work by Intero and its agents and we're so pleased to be part of this continuing local success story. Intero provides by far the most comprehensive back-up to its agents in this area and thus also attracts the very best real estate talent. It's therefore no coincidence that the company has for the first time gained coveted #1 status, in competition with all the other major brokerages serving the region. It's also worth bearing in mind that market share is derived from a range of statistics. These include listing units, sales units and volume and Intero is leading in each of those categories! This is also great news for our clients, because it demonstrates the additional level of visibility and aggressive marketing that our close association with Intero affords them. And as you can see from the steep incline of the graph in recent months, the situation is only likely to get even better! Why not contact us today and learn more about the added value of selling your home through a leading Intero agent.